It's time for Speed Craft Challenge #3 and there is a bit of super exciting news to go with the card this week. THE SPEED CRAFT CHALLENGE BLOG has officially been launched by Ingrid and Keren and I will be there every second Thursday as one of their Design Team members! I do hope you will check it out to see the gorgeous creations that my co-teamies have made, you won't be disappointed! This time our challenge is being hosted by the very talented Keren and she has chosen an inspiration photo for us. I will give you all the challenge details in a bit, but first, here is my card. Here is the inspiration photo that Keren gave us. I really liked the neutral tone with the pastels, so I drew from that. 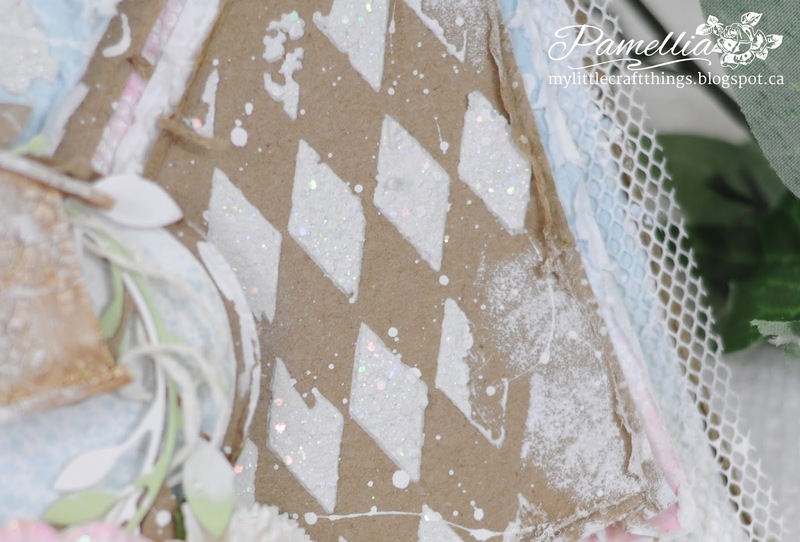 I also incorporated the diamond pattern and since I got a girly feel from the photo, I went frilly!! For those just joining us, here is the idea of our Speed Challenge. You can get all of your products ready ahead of time, then you set a timer for 10 minutes, start the timer and then craft like your pants are on fire! When your 10 minutes are up, you have to stop and show us what you made. To be fair, not everyone will finish their card or project, and that's OK, just be sure to tell us how long it did take you to complete it. The wonderful design team (Ingrid, Donna, Nikki, Keren and myself) will be choosing the top 3 as well as one lucky winner who will receive this fabulous Christmas Card Kit made by moi. I do hope you will go on over and enter in all the fun with us! Ready, here we go: 10 MINUTES AND COUNTING! I thought I was being such a smarty pants this time around. I used Kraft paper instead of stamping and inking white paper. And I was on a roll, all I needed was a sentiment, right? Wrong! I decided I needed some pretty flowers and some leaves and some glitter and a birdhouse, and, and, and...BLAM!! 4 HOURS LATER!! The birdhouse and bird are made from Martha Stewart polymer clay, painted with Ranger Picket Fence crackle paint, sprayed with brown diluted paint then highlighted with white paint. The wreath is from Poppystamps. I cut one green, one white and one kraft then attached them by winding twine around them. 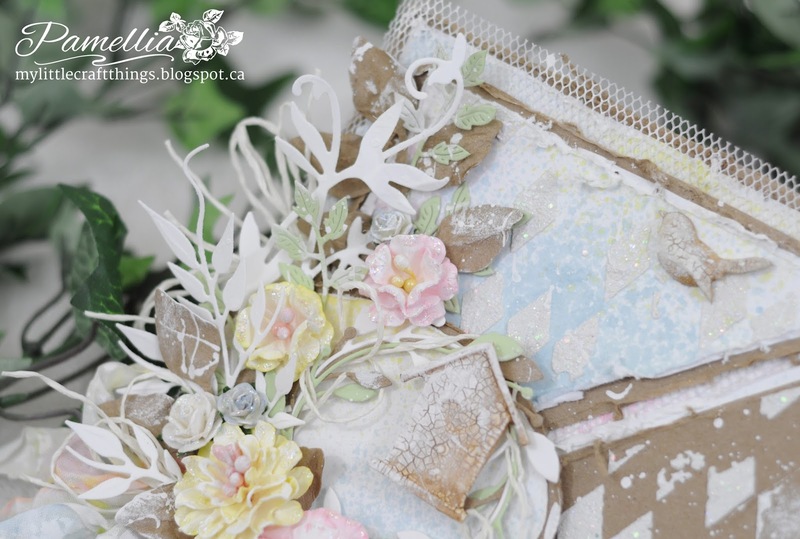 The flowers are cut from Joy Crafts Flower 4 and coloured with Tim Holtz distress inks Spun Sugar and Squeezed Lemonade. 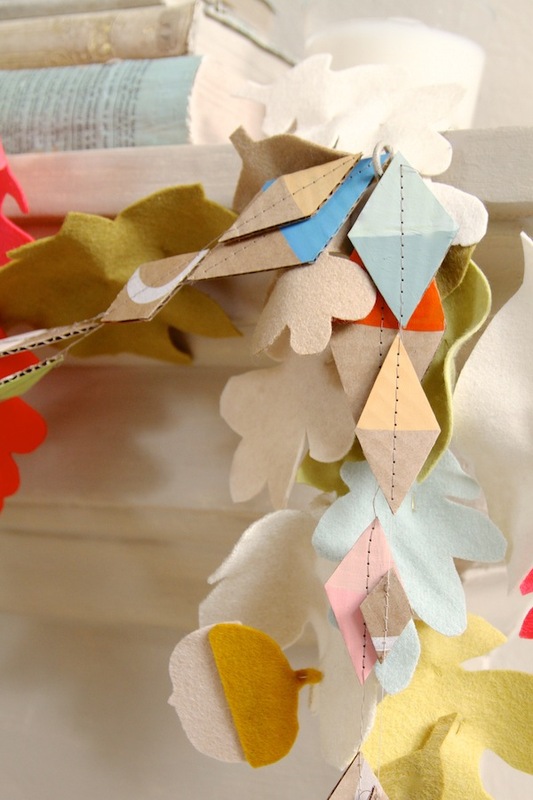 The leaves are Spellbinders - Foliage, Cheery Lynn - Leaf Set, Marianne Designs - Garden Branch and Joy Crafts - Leafy Branch. All the flowers have been glittered up with Ranger Star Dust Stickles. I would like to send out a special thank you out to two talented ladies REBECCA BRADSHAW and MAJA (Cebelica) for teaching me that glitter is not just for Christmas. 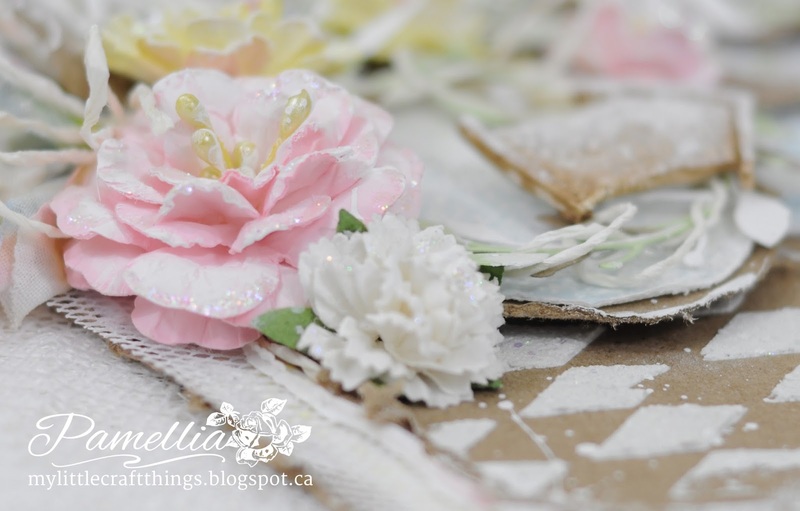 I used my Crafter's Workshop Harlequin stencil and my Home-made Glitter Paste (you can find the tutorial for that here) to add the pattern on the background. I added a layer of crinoline between the two back layers, just for a little shabby interest. SO SPARKLY! The ribbon was coloured with Tim Holtz distress inks Spun Sugar and Squeezed Lemonade and Hero Arts Shadow ink Summer Sky. I also added a couple of twine bows to match the twine wrapped around the wreath. 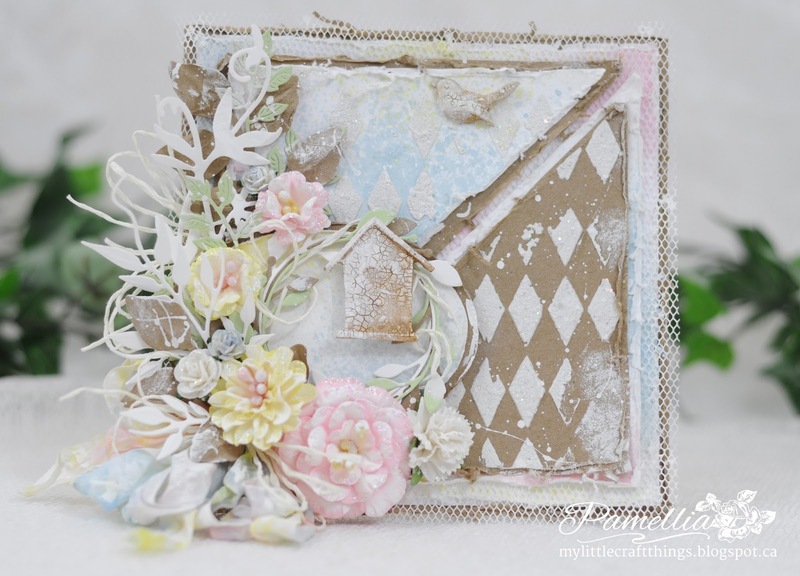 I am entering my frilly pastel card into the following wonderful challenges! This is super lovely. You can do absolutely gorgeous cards, better cal them art pieces, Pamellia. I'd put this in the frame and hang it on the wall. It's simply stunning in gorgeous pastel colours. You made these flowers yourself?" O.o Goodness girl, do you ever run out of ideas? They are way more beautiful than the store bought!!! And glittery!! <3 <3 :D I will have to google the Joy crafts die you used and I think it will end on my shopping list (especially if you ever do a tutorial on how to make these *hint, hint* :P). Have to figure out how to photograph this without having my hands in the frame...need them to work the camera...tricky! Hmmmmm. How gorgeous, such beautiful work, love it! Such a great idea for a challenge! This is so beautiful Pamellia. All your detailing is so gorgeous and the textures are wonderful. Another stunning card. Still don't know if I would manage ten minutes even if all was planned, but looks fun so probably will join in at some point. 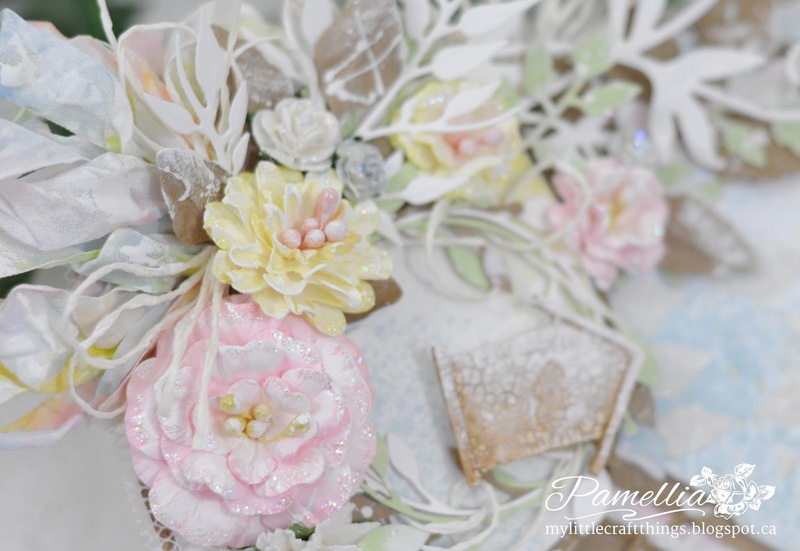 Stunning card Pamellia. I think you should take a photo after 10 minutes have passed, to show us where you were up to, in that time. What a beautiful card. The pastel colours are really pretty and the Kraft card stock is a nice touch too. As usual your flowers are outstanding. I will definitely be checking out the new challenge blog. Sally D.x. Oh my stars ... this is absolutely gorgeous my friend!!! LOVE the design and all the BEAUTIFUL elements! GREAT, GREAT job!! Thanks so much for joining us at The Sisterhood’s ‘LOTS OF LAYERS’ challenge and please come back again soon! Oh how beautiful and subtle todays card is ,i love it all and the flowers are just beautiful tis no wonder it took you 4 hours ,but well worth it . 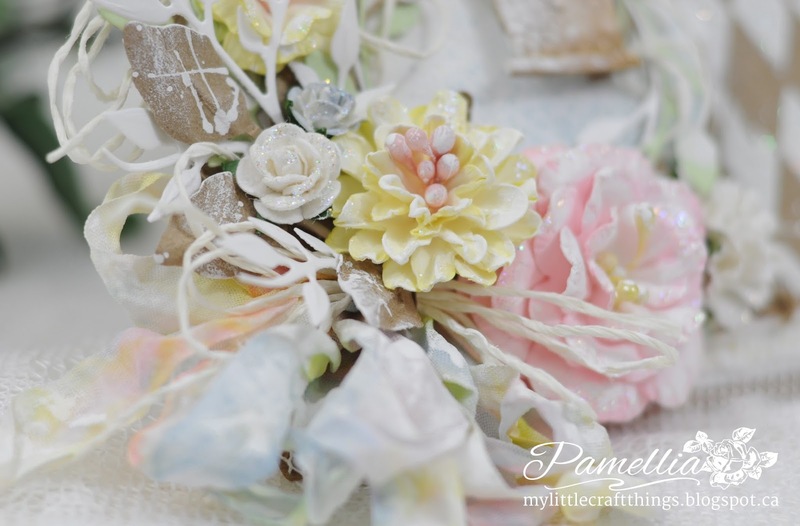 Love those soft, delicate colours, Pamellia and your amazing flower arrangement! GORGEOUS love this mixed media and of course the most gorgeous flowers and bird cage and .....the list goes on ....oh and colours used..
What a beauty! I hope to try my hand at the ten mins challenge later tonight :) really inspired by all the beautiful work you and the other DT have on the challenge blog. Did smile at what the gal, who took 15 hours to make a card, would do in 10 minutes lol! Fabulous card Pamellia. I could never ever make it in 10 minutes. Even if I would take everything ready to go since I keep changing things along the way. Bad habit of mine ;-) The think pink with stitching card I made took me over 12 hours including drying time for the background papers that is. But still. But it sounds like fun though. You are very brave to take part in it. I really love your card. Thanks Veerle, it's great to have you back! WOW this is stunning Pamellia! I love your gorgeous flowers and that fabulous diamond glittered background!! Just GORGEOUS! 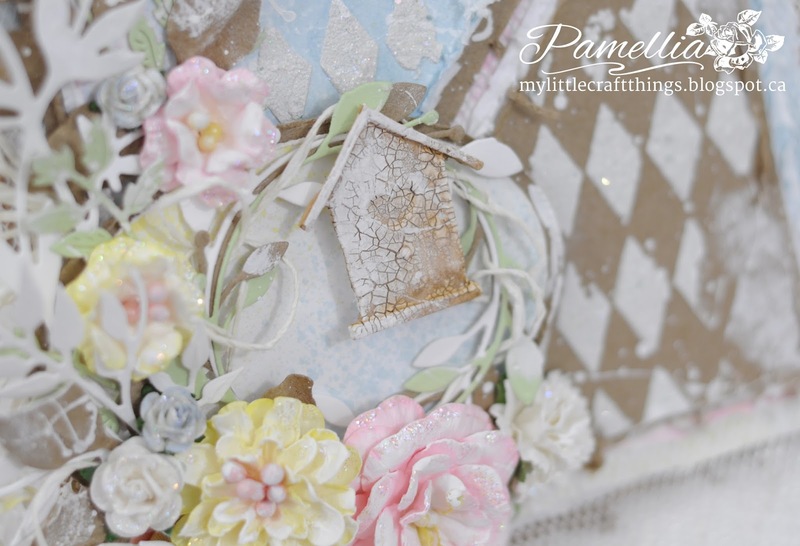 LOVE all of the flowers and shabby details but that birdhouse and bird just make me swoon! What a beautiful card! I love the kraft with the pastel colors. Fabulous texture and embellishments. Congratulations, it looks like you were a winner over at Mark's Finest Paper. Thanks Shirley! What is Mark's Finest Paper? Never heard of it. You cannot rush a masterpiece and that's just what this is!! Beautiful! This is fabulous! To create this project in 10 minutes is pretty amazing. I couldn't create a card in 10 minutes if my life depended on it! Very nicely done! Thanks for leaving this in our mailbox here at 613 Avenue Create. Just gorgeous! I love all of the beautiful details....and I do not think I could ever make a card in 10 minutes : ) Your 10 minute background is awesome- loving the Kraft as a contrast. Beautifully done! I was going to send you a tiara, tights and a cape when I thought you had made this amazing card in 10 minutes. So glad to know that was not the case. But you still deserve a cape, tights and tiara for your amazing card creating super powers! Love this!! !